Great video, good to meet you and glad you enjoyed the day. You would enjoy Mallory Park next month! ChrisHolmes wrote: Great video, good to meet you and glad you enjoyed the day. You would enjoy Mallory Park next month! Thanks chris, it was very fun. From what I can tell I got overtaken by 4 cars but then went back around 2 of them then over took 3 other cars so I ended up a place above where I started. I’m happy with that. Mallory park is one of my favourite tracks because of the size of it. I have done it twice with a bike and I really like its flows. ChrisHolmes wrote: Photos of the gravel damage added above. What was the white car going off behind you in the second vid ? Afternoon all. Do we know who the copper red 8 belongs to that went out on track at 11:20 with the main group? He was shooting 3 foot flames every time he went past the grandstand just before the pits. It was a glorious sight. No sorry I was the 11:40 track and the only rx8 out. Ah, cheers pal. I'll drop him a PM at some point. Thanks Devn_Fourie, I think I saw parts of your session too. May I congratulate the Events team on yet another superb event (despite not having any sauce for the bacon butties). 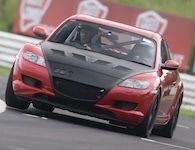 Thoroughly enjoyed the limited time I had on track, and thanks to Chris Holmes for the passenger ride and reciprocating. I'll post the videos up soon. Craner and full throttle is superb, and the federals really allow us to make full use of the whole width of the circuit (and more, ahem!). I can’t seem to be able to post my track video up on the forum, it gives me a message saying incorrect file format ( never had a problem before) I have also tried to post it on YouTube and the copy the link, but YouTube tells me the video is too long.ffs it’s 21 mins. Is there a limit to the length of video you can post? Didn't get on circuit, but enjoyed watching those who took part from the grandstand at Hollywood. Took a good plod around... According to the phone ended up walking around 7.5 miles! Less stressful to watch than the England game! Very educational session Sean, you even included how to have just a little off at Redgate! I was distracted by my passenger!